It is unusual to report all the metals up (bar spot iron ore). 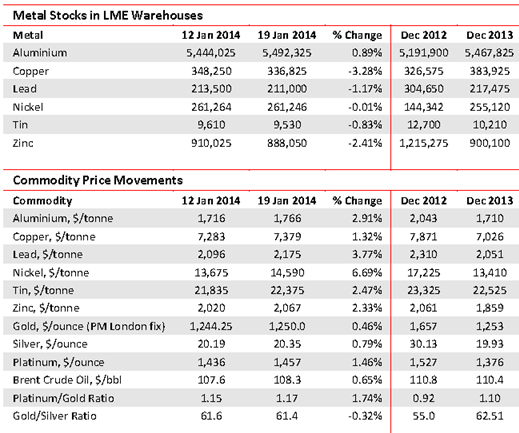 Commensurately, warehouse stocks retreated up to 3%, bar aluminium which remains the anomaly. Their 12-month change, shown here, reflects the mood of the market. Aluminium remains in gross oversupply with the major refiners nibbling around the edges of cutbacks and closures. Copper stocks are at last nudging down, as cancellations of major new projects are felt and older mines feel the strain. Lead stocks are heftily down but this has not been reflected in the price. Neither has the zinc price yet reflected the fact that stocks are down a full 27% since end December 2012. Nickel’s oversupply has a structural look about it with stocks, having fallen over 60% in 2011-12, rose almost 90% in 2013. Tin has been much affected by the decision of Indonesia, the major exporter, only to allow shipments of refined metal. Stocks fell a sharp 25% and are now but 9 days’ consumption, compared with 50 days for aluminium. Zinc remains the love-it-or-hate-it metal. Abandoned as a mineral by Anglo, but beloved of Glencore, its surplus was reflected in a stodgy price around $2000/t but at last stocks appear to be coming down, now a respectable 26 days’ world offtake. Copper remains the miners’ favourite with all the major producers reporting higher output. We see mined output trending towards 18-19Mt this year, from 16Mt three years ago. Increases are noted from the biggest producer, Chile, which expects to exceed 6Mt for the first time thanks to the efforts of state-owned Codelco, BHPB, Glencore and Anglo. According to Sonami, the national mining association, the sector grew by 5.5% last year. Zambia’s output, too, rose in 2013. In the first 11 months it registered 915,773t compared with 755,359t in like 2012. Cobalt production (5875t) showed a commensurate increase. Given its forward-looking approach to investment, we expect to see Zambia’s output continuing to grow. Hope for aluminium comes in the form of the auto industry. The second-favourite, body sheet is lighter than steel and does not rust. It is more expensive. Alcoa, the major aluminium smelter, believes in the sector and has completed a $300M expansion for the purpose at its Davenport, Iowa facility. 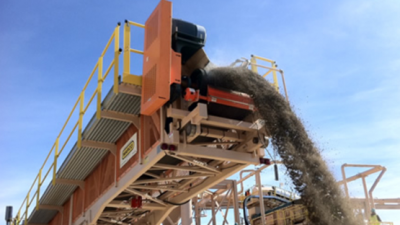 Still on aluminium, Rio Tinto Alcoa, world No 2 smelter behind UC Rusal, has inaugurated its $1.1bn AP60 smelter at Arvida, Quebec, which it claims to be the most technically advanced in the world. Its capacity is 60,000tpa. Nickel has few friends. The decision by No 2 producer, Indonesia, at 20%, to ban the export of non-processed ore is felt by the trade as a temporary prop, but not a solution to the metals’ problems. There is plenty available metal and output has risen 20% since 2011. New projects outside Indonesia include those in New Caledonia, Madagascar and Brazil. Tanzania’s Dutwa venture (African Eagle) has been halted.